Perfect for the work week or weekend travels, this structured Rebecca Minkoff satchel is an easy way to stay organized. Also available in Mink and Brown. 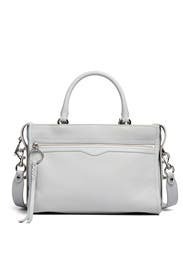 Ice grey pebbled leather satchel with front zipper detail and braided pull tab. Top zipper closure, one Interior zip pocket, and 4 interior slip pockets. 13.25"W X 8.5"H X 7"D.